Slot systems provide massive amount of data that present many questions about the variables in game performance allowing for detailed reporting on each machine. The analysis looks at recent past months of revenue and layers in those utilization metrics that offer the efficiencies regarding inventory selection. The reporting determines the global performance of the gaming floor by the range of variables that exist within the floor across the review period. 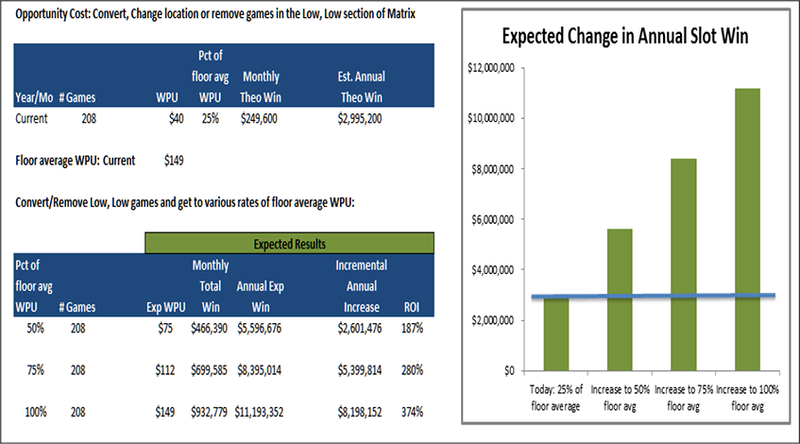 Our analysis interprets machine data and applies analysis on WPU and Utilization metrics that compiles final data in a matrix ranking each game on the aggregate value of these variables against every other game on your floor. The reports culminate by forecasting the dollar value of the revenue enhancement opportunities by the recommended product mix and game placement. Reporting can also be conducted on thee Net Win for a machine. For example, examine all games after commissions, for the games that are commission fee based games and compare to the floor. The reports are excellent aid to building capital budgets for games and predicting replacement timing of games on floor as well. 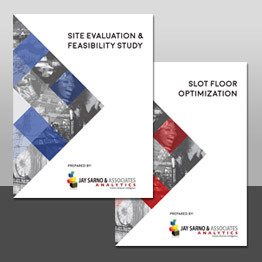 The analytical sets, proprietary algorithms and statistical techniques enable slot managers to immediately improve floor performance and make better informed purchase decisions. What games generate your best Net-Profit? Where should your games be located? How do you fix your Theo-Actual variance? What games should you buy, keep or sell? See how we can deliver results in as little as two weeks. “We were building plans for a new expansion of the property, but we felt our current floor results could be better. JSA's optimizing package was unique in that we quickly saw the effect of operations and marketing costs and their impact on our profits with JSA’s Triple Net analysis. Our clients include: State agencies, trade groups and the most renowned management consulting firms. Additionally, over 50 properties: commercial, Native American; large and small; resort/ regional around the world have profited from our work since 2002. JSA is offering a sample of the reports you can expect as one of our clients. Please fill out this form and we will be in touch.